Incorporating outdoor living amenities can create beautiful, usable outdoor spaces that can aesthetically complement your property and considerably boost its curb appeal. No matter how small or expansive your outdoor space is, you can make your lawn or garden look and feel fantastic by adding custom-designed outdoor features. Taking the time to add pergolas, ramadas and gazebos to your property would give you a place to relax after a tiring day. But home improvement projects like these will need the services of a good, reputable professional contractor. And here at Phx Pavers & Landscaping, we can help improve the vitality and versatility of your outdoor spaces by designing and building these outdoor living structures. Equipped with proper installation equipment and materials, we will ensure your project's aesthetics, functionality and durability. 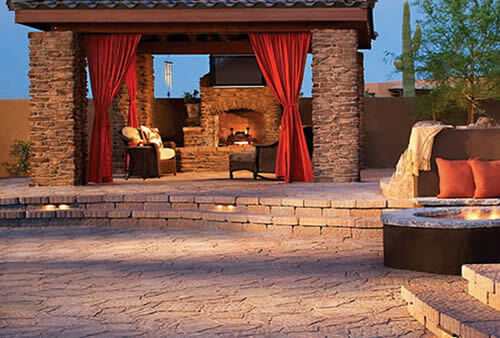 Phx Pavers & Landscaping is an expert builder of pergolas, ramadas and gazebos. We are state-licensed, registered, and bonded professional masonry and landscape contractors, so we are the best people to handle your project. Our expertise is beyond the installation of brick, stone, and concrete; we specialize in landscape design and outdoor improvement projects. Just like with any major project, we help you plan ahead. Since your outdoor space is finite, we make sure to design a specific plan to maximize every square foot of space that you have. We understand local, state, and federal regulations, so rest assured that all of our works are compliant with Arizona laws. Our company offers custom-designed pergolas, ramadas and gazebos to make your outdoor living become a more pleasant and stunning experience. Whether you opt to have shaded garden walkways, enclosed porches, freestanding or attached pavilion structures, we can tailor fit your preferences to suit your lifestyle and budget. Pergolas. They are open-air or roofed outdoor features usually built from thick wood or concrete. They include seating areas and garden paths, draped with vines or latticework, and flanked by arches or vertical pillars to protect open terraces. They are often best incorporated in other outdoor living features, such as outdoor kitchens and pool decks. Ramadas. They are open (no wall) porches or arbors, usually with wooden or climbing branch ceilings. They are designed to create shaded shelters to protect property owners, plants, water features, and other features from the heat of the sun. They are typically constructed inside gardens or lawns and are arched or square cornered. Gazebos. They are standalone or attached features best installed in garden areas or backyard patios. They serve as places of rest and relaxation, complete with overhead canopies perfect for newspaper reading during sunny mornings or family get-together nights. They can be tent style, turret shaped or octagonal. For design themes, we can go for natural, rustic, traditional or sleek and contemporary. Whatever your taste, we can find something that will add shape, texture, color, and function to your pergolas, ramadas and gazebos. We keep in mind the architectural style of your property, too. Talk to one of our representatives, and let us show you how we build beautiful pergolas, ramadas and gazebos on our clients’ properties. Call us at (602) 992-0468‬ today!